Coroner's autopsy results delayed, won't be released for "at least two or three weeks"
A county coroner says he will not release for "at least two or three weeks" autopsy results that would show if one of the victims of the Asiana Airlines crash was struck and killed by an emergency vehicle. San Mateo County Coroner Robert Foucrault had said on Sunday that he hoped to have preliminary results on Monday that he would make public once they had been shared with the girls' families. Foucrault said on Monday that he now wants to wait to report the causes of their deaths until his full investigation is completed. He says he made the decision independently and that neither city officials nor federal accident investigators had asked him to postpone releasing the information. At a press briefing Monday morning, National Transportation Safety Board Chairman Deborah Hersman called the issue "very serious." "We are still looking at this issue," Hersman said. "We are reviewing airport surveillance video," she said. "The initial read of the video wasn’t conclusive." Foucrault said one of the bodies was found on the tarmac near where the plane's tail broke off when it slammed into the runway. The other was found about 30 feet away from where the jetliner came to rest after it skidded down the runway. Foucrault tells NBC Bay Area they were alerted by the San Francisco Fire Department "that a fire truck may have played a role in the death of one of the girls," and are trying to determine if the teen died as a result of the plane accident or a "secondary incident." San Francisco Fire Department Chief Joanne Hayes-White and Assistant Deputy Chief Dale Carnes both raised the possibility at a Monday news conference with first responders. "There was a possibility one of two fatalities might have been contacted by one of our apparatus at one point during the incident," Carnes said. Carnes said the department is conducting its own investigation. The two victims who died have been identified Ye Mengtuan and Wang Linjia, both 16 and students at Jiangshan Middle School in eastern China. 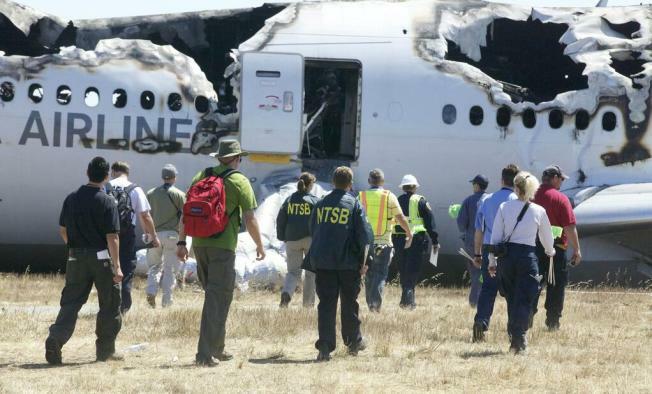 In addition to the two deaths, Saturday's crash at the San Francisco International Airport wounded 180. Of the wounded, 49 are suffering from critical injuries, SFO officials said. 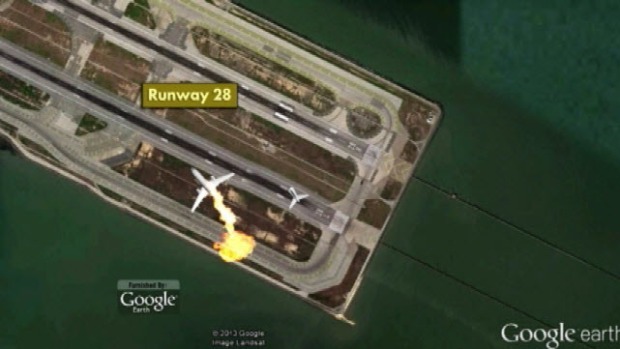 Animation of the plane crash of Asiana Airlines Flight 214 at SFO. 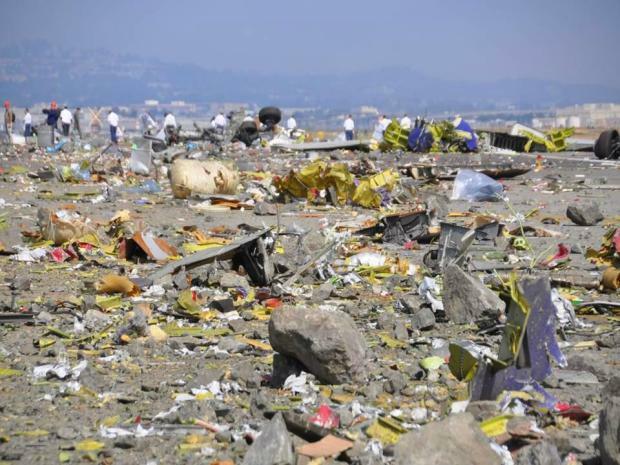 The plane's cockpit voice recorder showed the pilot attempted to abort its landing just 1.5 seconds before it crashed. Passengers described chaos in the aftermath of the accident, with many of the 291 onboard escaping by sliding down emergency inflatable slides. A few exited through the back of the plane in an opening that was caused when the tail section tore off. In the immediate minutes after the crash, police officers threw utility knives up to crew members so they could cut away passengers' seat belts. Some passengers doused themselves with water from the bay, possibly to cool burn injuries, authorities said. By the time the flames were out, much of the top of the fuselage had burned away. Inside - the tail section was gone, with pieces of it scattered across the beginning of the runway. One engine was gone, and the other was no longer on the wing. Benjamin Levy, a businessman seated in the Boeing 777 jetliner's 32nd row, told NBC Bay Area the plane seemed to had been coming in too low for landing at San Francisco, and the pilot "missed the runway quite completely."